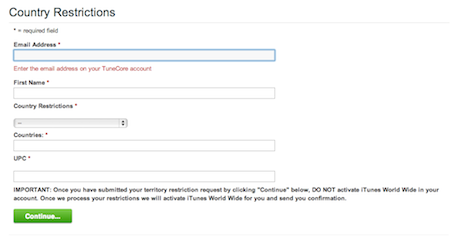 How can I add new iTunes Territories? How can I upgrade my live release to iTunes Worldwide? In December 2012 iTunes added over 45 new territories to their store including Russia, India, Turkey, Israel, Ukraine, African Territories and much more! See all current iTunes Worldwide Territories below. When you distribute your release and reach the “Add Stores” page select “iTunes”. Your music will be sent to the all the iTunes territories listed on the bottom of this page. As iTunes adds new territories your music will automatically be sent to those new stores. If you have any territory restictions use the Countries and Regions Tool above. Select your live release from your Discography page. There are a few more steps. Click the “Save” button that should appear on the screen. 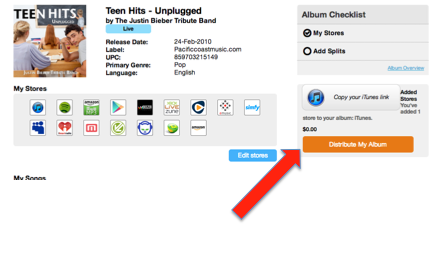 Then click the orange “Distribute My Album” button on the right. The next screen should be your shopping cart. Click “Continue to Checkout”. Your music will be sent to all the iTunes territories below within 24-72 hours. 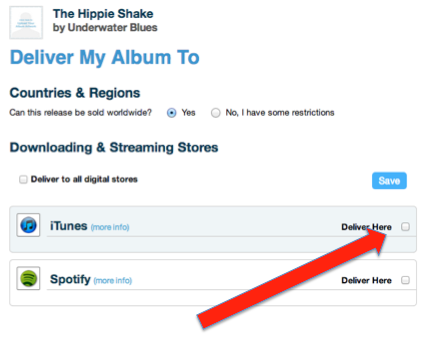 As iTunes adds new territories your music will be automatically sent to those new stores. Click the “Contact Us” link on the pop up box. Fill out the form, select your territory restrictions and click “continue”. Close the pop up box on your TuneCore screen. DO NOT click “Activate Worldwide” again! You should receive a confirmation email within 15 minutes of submitting the form. It may take TuneCore 1-2 business days to process your request. We will send you a confirmation email once your territory restriction has been processed.